SoundMagic E11D review | What Hi-Fi? When some smartphone brands ditched the headphone jack, it not only gave Bluetooth headphones a boost, but also ones with USB-C and Lightning connectors too. Many renowned headphone brands now have one or the other (or both) in their artillery, including SoundMagic. The E11D (the ‘D’ stands for ‘digital’) are the brand’s first pair of USB-C headphones. The 3.5mm connector has been replaced by a USB-C one, designed to plug straight into the increasing number of Android smartphones (such as the Google Pixel 3 XL, Samsung Galaxy S9 and OnePlus 6T), and Apple’s latest iPad Pros, using the connection. 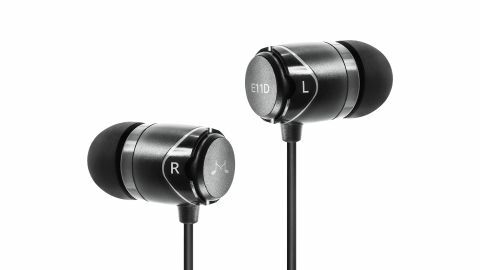 The E11Ds are one of the latest additions to SoundMagic's E11 family of in-ears, which include the five-star wired E11Cs. The Ds retain the same three-button remote (for playback control and call making), hockey puck-sized carry pouch, driver and cavity as the E11Cs, with the main difference being a dedicated DAC, which handles files up to 24-bit/96kHz, and amplifier needed to make things work. The cable is a plain black rather than the lovely silver twisted cable on the E11C. We can’t help feel that’s a shame considering that the brand’s budget in-ear design has always stood out from the mass of all-black buds. However, SoundMagic has crammed more technology into these in-ears and managed to make them only a tenner more. We like that the E11D’s 90-degree USB-C connector can be inserted into a smartphone either way, allowing the user to choose which side of your phone the wire sticks out from. Swapping between Google, OnePlus, Huawei and Samsung smartphones, we are pleased to be met with a sound similar in character to the E11Cs. They’re clear, tonally sound and as communicative as you could reasonably expect for the money. Whether we stream music from Tidal or play a video clip from YouTube, the E11Ds offer a welcome balance of engaging clarity and easy listening balance. With The 1975’s Inside Your Mind, both the synths, string and piano composition and Matty Healy’s ballad-esque vocal are given appropriate staging and even weighting across the frequency range, and the rendition is far from devoid of drive or rhythmic know-how. There’s a slight caveat: in place of the E11Cs’ lush full-bodiedness is a comparative thinness and lack of solidity. The burdened piano and vocal lose a layer of their captivating richness through the E11Ds. Simply put the digital variants are not quite as telling. Across the phones we used that had both USB-C and 3.5mm audio output connections, the E11Cs outperformed the E11Ds – which suggests that the DACs and amplification circuitry inside the phones are superior to the one in the headphones. Users of smartphones with both connections that can output audio from either, should therefore stick with traditional in-ears. As for smartphone owners limited to a USB-C output, we’d ultimately recommend the performance and convenience of budget Bluetooth headphones, such as the Award-winning Beyerdynamic Byron BT buds or AKG Y500 Wireless on-ears. But if you can’t stretch your budget, or your preference lies with the wire, these SoundMagics are perfectly good in-ear headphones. They could also serve as a natural upgrade to a pair of smartphone bundled USB-C headphones. While there is a dearth of such buds for comparison, the E11Ds prove considerably better than the Pixel Buds boxed with the Google Pixel 3 phone – clearer, fuller and more detailed by far. With the right audience, the SoundMagic E11Ds could well find favour, as we believe they deserve to.